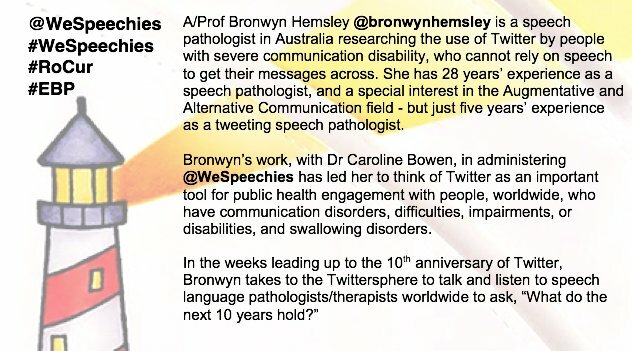 The Twitter handle @WeSpeechies, and the associated hashtag #WeSpeechies, were founded in March 2014 by Caroline Bowen @speechwoman and Bronwyn Hemsley @BronwynHemsley, both of whom are Australian Speech-Language Pathologists (SLPs). 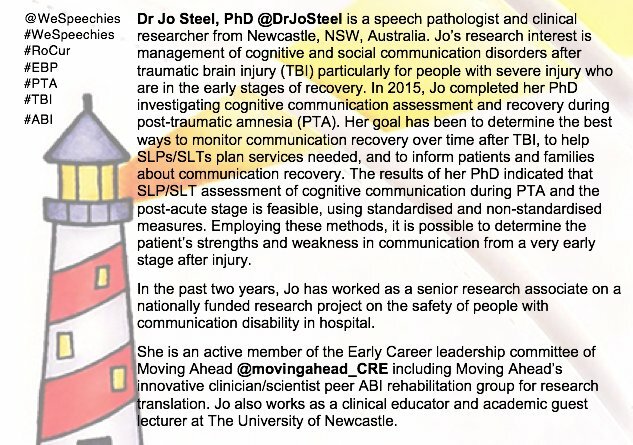 The handle provides a curated meeting point, on Twitter, for SLPs, Speech & Language Therapists (SLTs) and SLP/SLT students to promote international professional communication. Its purpose is to facilitate mutual support, helpful connections, sharing of peer reviewed articles and relevant links to websites and blog posts, and opportunities for professional encouragement colleague-to-colleague worldwide, in all areas of practice. Scroll down to the 2017 calendar to see who will be curating, and their topics. 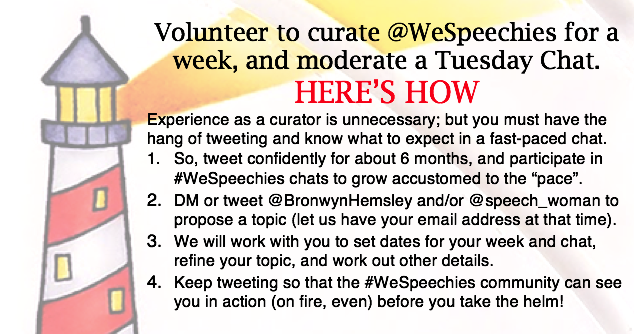 #WeSpeechies Seeks (experienced tweeter) volunteers to curate for a week. 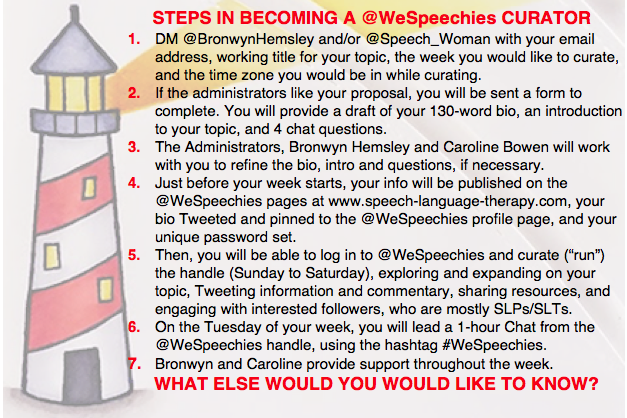 Please DM @BronwynHemsley and/or @SpeechWoman with your expression of interest. Available weeks are listed in red on the calendar below. If you intend to Tweet more than a handful of times, let your followers know that you may be sending multiple tweets. That way they can ‘ignore you’ temporarily if the chat topic is not interesting for them. when the chat transcript is generated there will be fewer confusing gaps in the interactions. If your Tweets are protected (i.e., if you have a padlock on your handle), people who are not your followers will not be able to see your contributions to the chat. Please turn this protection off if you plan to Tweet into a #WeSpeechies chat. There are instructions for turning protection on and off here. 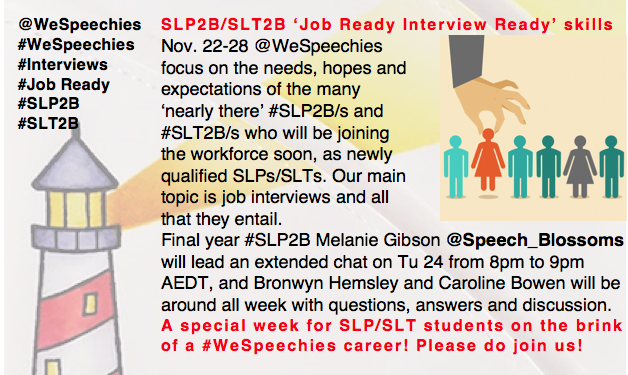 Note that if you wish to, while a chat is in progress, you can engage in ‘side chats’ without the #WeSpeechies tag. You can review other conversations later. Side chats are not considered to be bad form! 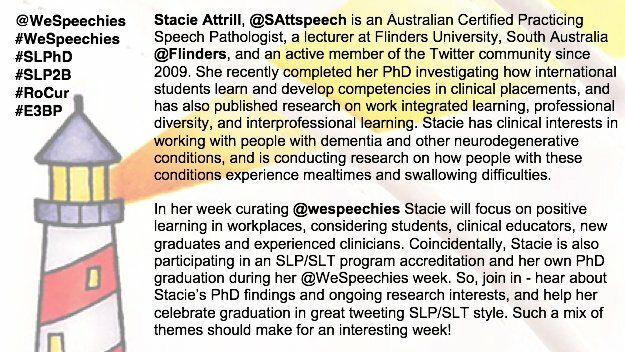 The @WeSpeechies administrators find TweetDeck makes it easier to participate in #WeSpeechies chats. Try it before the chat is due to start. 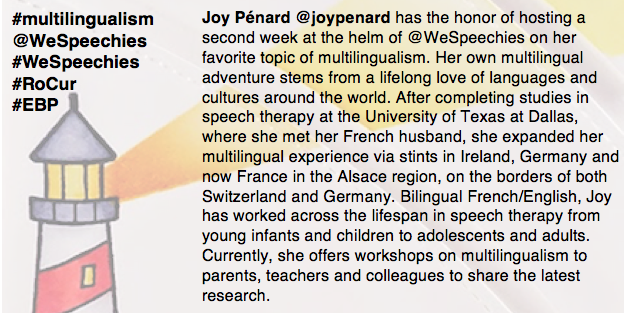 Moderators: Do not schedule Tweets from the @WeSpeechies handle! The the term 'rotation curation' means that the 'Curator' role rotates. 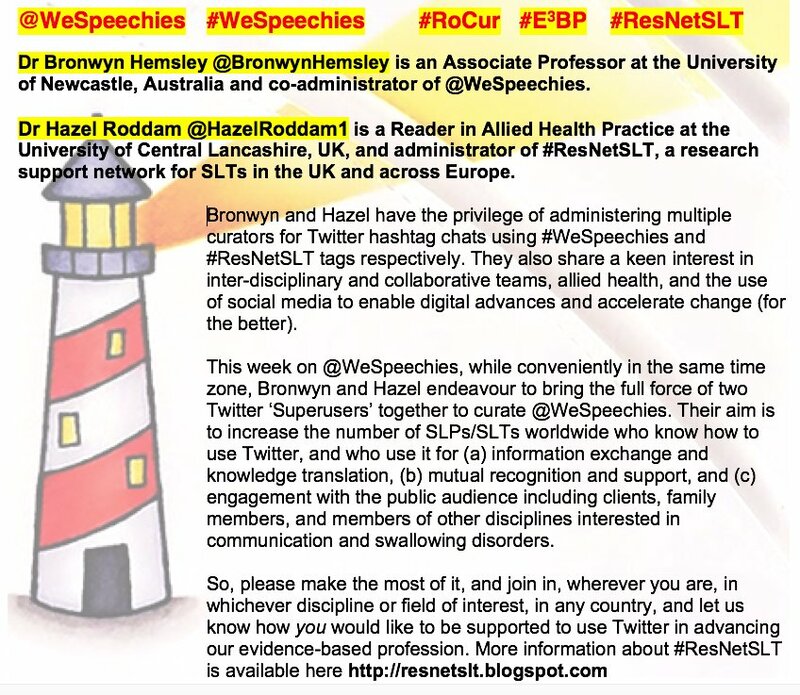 In the case of the @WeSpeechies handle it rotates weekly, Sunday to Saturday, between clinicians and academics who are expert in their respective SLP/SLT fields, as well as @WeSpeechies followers who do not necessarily see themselves as 'experts' but who have interesting things to say and positive contributions to make. Not all Curators are SLPs/SLTs. Please let @speechwoman or @bronwynhemsley know via Direct Message (DM in Twitter) if you are interested in taking a turn in the role of Curator. 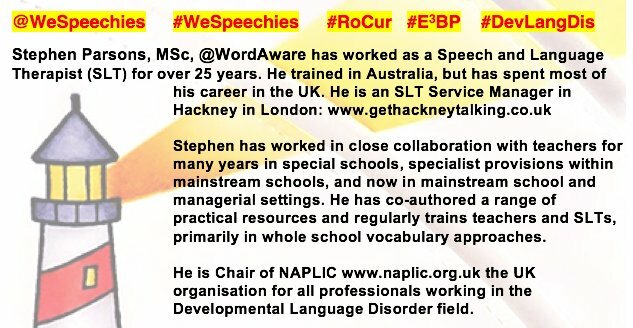 This involves administering the @WeSpeechies handle for one week (Sunday to Saturday), focusing on a topic within your area(s) of expertise or interest. 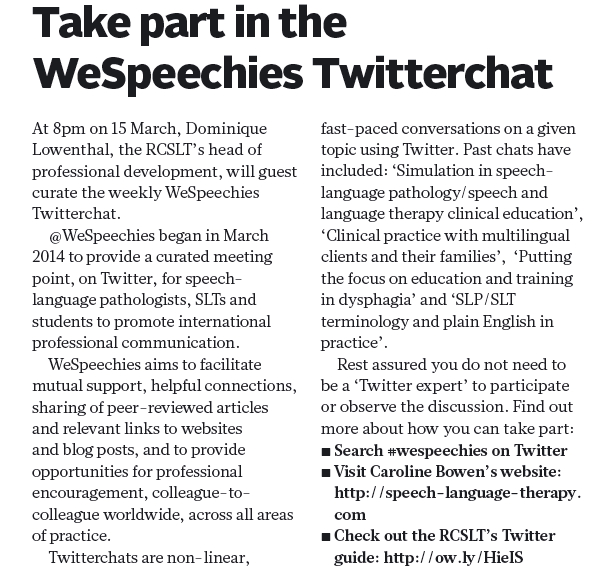 You would also moderate a twitter chat on the Tuesday in your week, from 8:00pm to 9:00pm in your time zone, or at another time that suits you, using the #wespeechies hashtag. For example, you might decide to run your chat from 8:00pm-9:00pm Tuesday, or 8:00am-9:00am Tuesday, in your time zone. Alternatively, you might be a located in a British time zone but decide to run the chat at 8:00-9:00pm Tuesday in a US time zone. As long as the chat happens while it is a Tuesday somewhere in the world, that's fine! 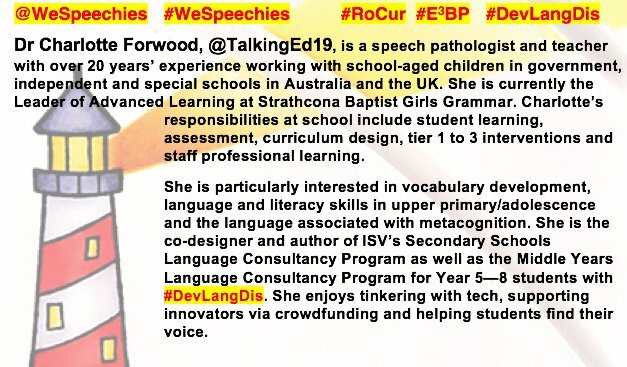 It is all part of @WeSpeechies connecting and engaging internationally across time zones. Please note that co-moderating chats, and co-curating a week is not permitterd. This means that only one person, other than the two administrators can take the handle (accessed via a unique password) at any given time. A Curator is not there to 'educate and teach' others, but rather to engage and connect with others in professional discussion around a topics of mutual interest. Twitterchats are themed, non-linear, fast-paced conversations using Twitter. Participants discuss ideas and ask and answer questions about a given topic. You do not need to be a 'Twitter expert' in order to curate, but it is sensible to participate in some chats before moderating one! The hour goes quickly and it can be hectic for the moderator. One or both administrators will be available to help, if you wish. 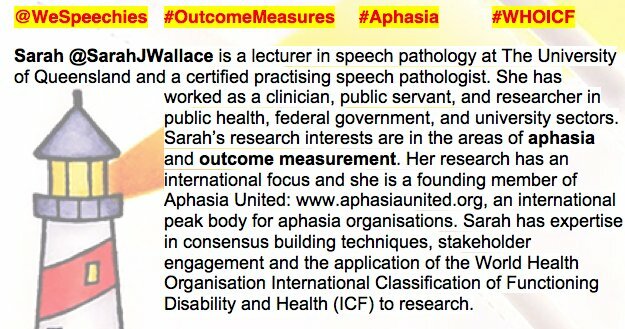 Topic areas of interest will include AAC, academic issues, aphasia, apraxia of speech, childhood apraxia of speech, children's speech sound disorders, conferences and meetings, clinical education, controversial practices, counselling and SLP/SLT, craniofacial differences, critical care pathways, doctoral studies in SLP/SLT, dysphagia, EBP, e-health solutions, ethics, fluency, engaging SLP/SLT students in Twitter and why, hearing impairment, humanitarian outreach in SLP/SLT, ICP2014, implementing change in your practice, independent/private practice in SLP/SLT, intellectual disability, interprofessional communication, language disorders, lifelong learning, literacy, motor speech disorders, multilingual matters, novel service delivery options, professional issues, RTI, research, social communication (pragmatics), social media for professional purposes, solo practice, stuttering/stammering, TBI, teamwork, voice, the student experience, working with nonverbal children, writing for professional purposes, and more. 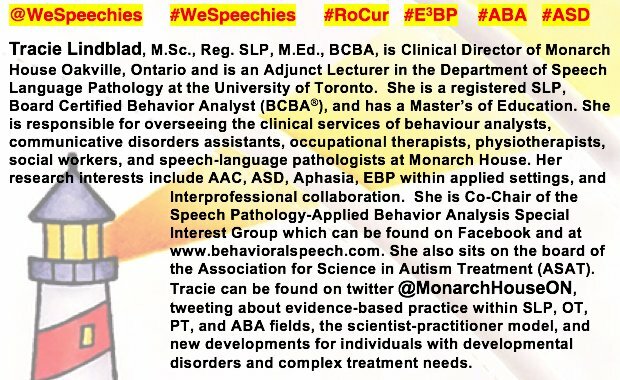 The @WeSpeechies RoCur handle is primarily for clinically oriented discussion and information sharing, with an emphasis on evidence based practice. 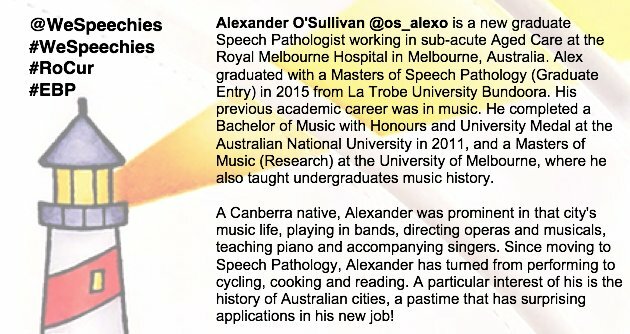 Most of its followers are #SLPeeps and #SLP2Bs from around the world who are interested to connect and engage with each other. 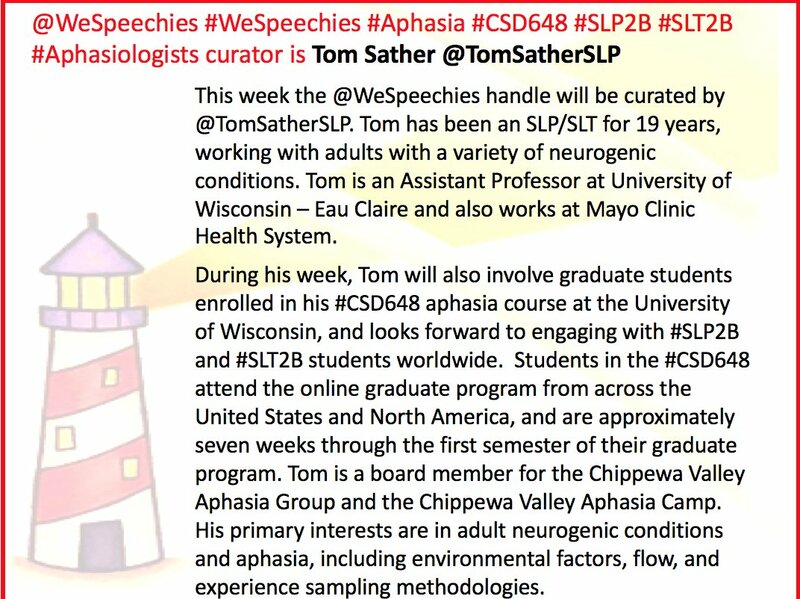 Over time the @WeSpeechies handle and #WeSpeechies hashtag will be used to connect across related disciplines and with the general public, including clients and their families and advocacy groups, so that people everywhere will know a lot more about who we are and what we do as Speech-Language Pathologists / Speech and Language Therapists. An informal survey of speech-language pathologists, by the @WeSpeechies founders in March 2014, revealed that many are critical of the way the #SLPeeps hashtag (’tag’) is sometimes used. This is because it is now a target for advertisers and spam tweeters. 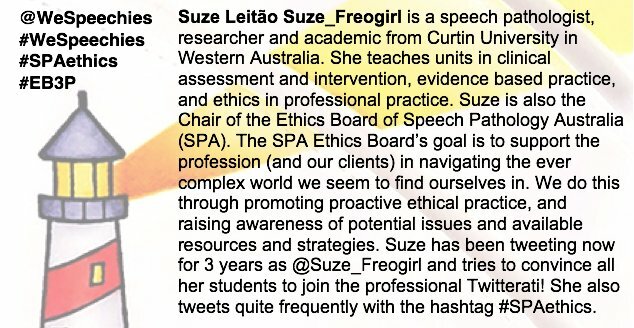 Companies and individuals promoting products (e.g., Apps, books, commercially oriented blogs, competitions, courses, hardware, materials, "offers" including trial offers and free 'redeem codes' in exchange for favourable reviews, software, and special deals of various kinds, tools and toys) Tweet repeatedly, using #SLPeeps. They do so in order to attract the attention of SLPs/SLTs (SEE TOP INFLUENCERS HERE and SEE ALL INFLUENCERS HERE). 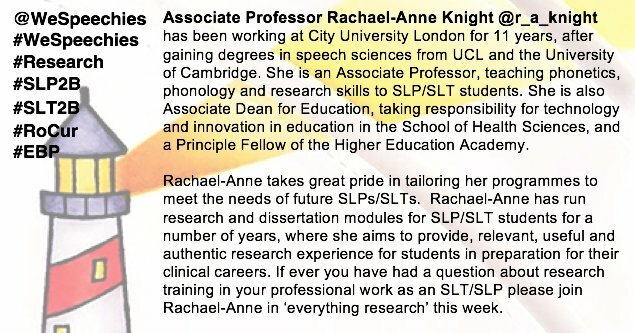 Unfortunately, this has reduced the usefulness and credibility of #SLPeeps for those seeking focused, relevant, SLP/SLT-oriented exchanges of information, and personal and professional interconnections, that are (1) evidence based and/or (2) theoretically sound, and (3) non-commercial. 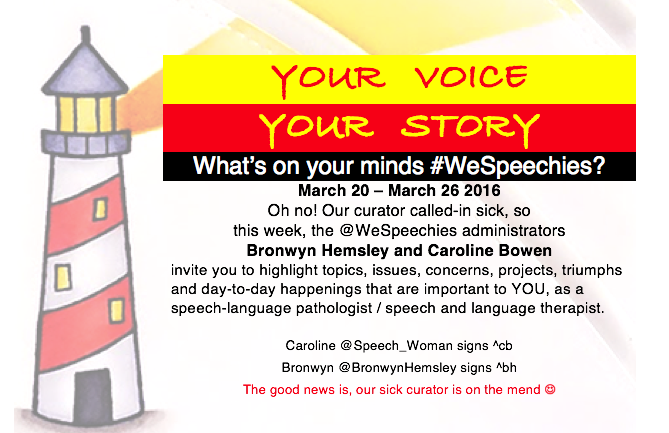 As its founders, Caroline Bowen (@speechwoman) and Bronwyn Hemsley (@BronwynHemsley) want #WeSpeechies to be different. 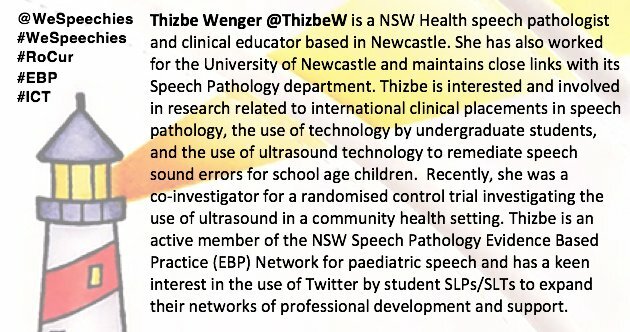 So, the first time a follower, or other handle, tweets advertising material using the #WeSpeechies hashtag we tweet back to them asking them not to do so again, telling them they will be blocked if they do. We will offer further explanation, by directing the person to this page, at that point. If they repeat their action, they are blocked without further ado. As administrators of the @WeSpeechies handle we find this difficult to do at times, as we often know and respect the colleagues and advertisers/vendors concerned, and realise they may be tweeting about products and using #WeSpeechies unaware of the implications. 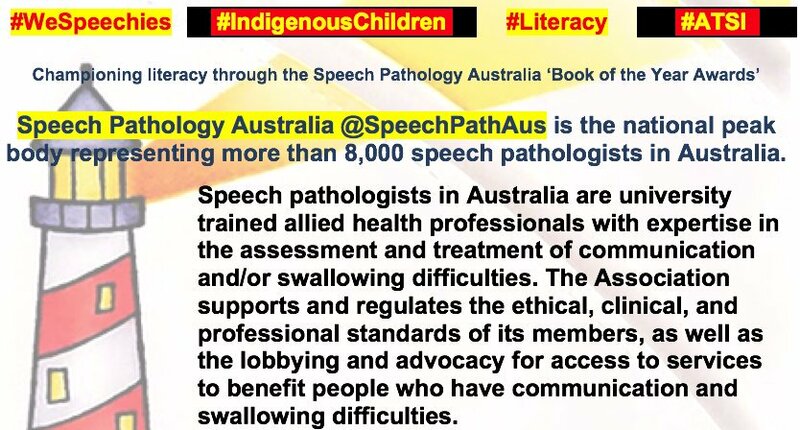 However, we will enforce this policy as we are committed to keeping #WeSpeechies focused on its raison d’etre. 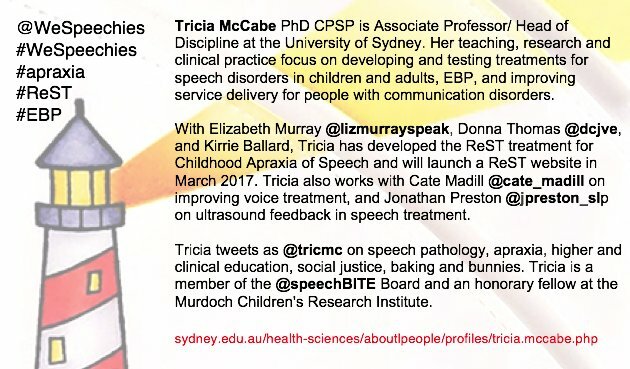 We request colleagues and associates not to include the #WeSpeechies hashtag or the @WeSpeechies handle in product endorsement Tweets. 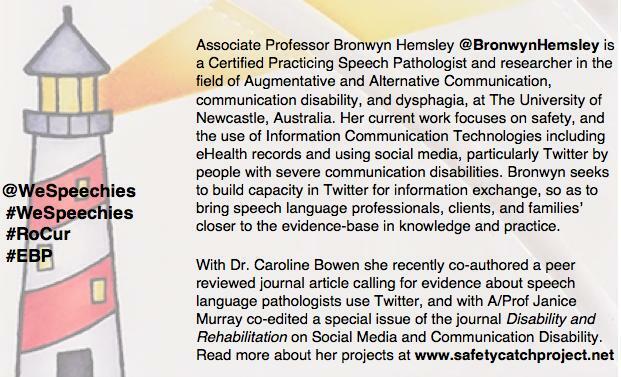 If linking to App reviews, book reviews, materials reviews, and the like (authored by you or by someone else) please first ensure that the review is composed in balanced, professional terms and does not imply endorsement, or suggest therapeutic benefit (e.g., avoid statements such as, 'the best App ever for AAC', 'ideal for SLI intervention', 'no SLP should be without this App / book', 'perfect for clients with Aphasia', 'the go to clinic for Voice patients'), or a 'cure'. If you do, you will be asked not to do so again, and if your action is repeated your handle will be blocked forthwith by the @WeSpeechies administrators. 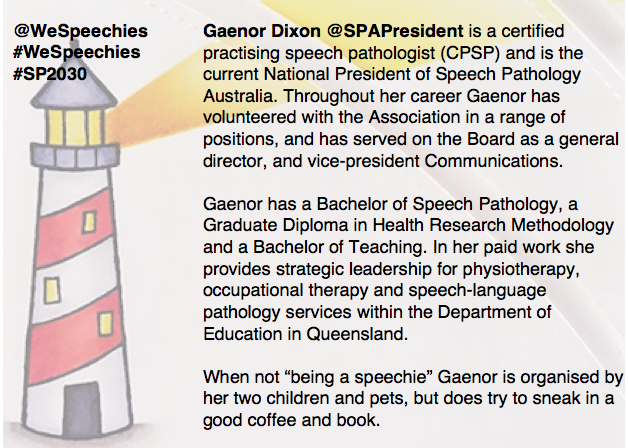 Advertisers and vendors may, of course mention and tweet to the @WeSpeechies handle. Furthermore we love to engage, connect and discuss topics of mutual interest via our handle (not our hashtag, mind) with our 'suppliers' - those who produce and sell the Apps, books, equipment, journals, materials, technology and so forth that are indispensable to us at work. 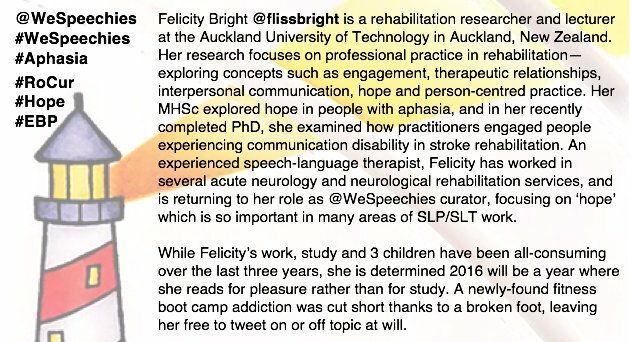 But, just repeating, we ask you to please keep the discussions 'non-commercial' and keep the #WeSpeechies hashtag advertisement-free. Information about selecting and requesting articles, and other readings, for discussion during your week is HERE. 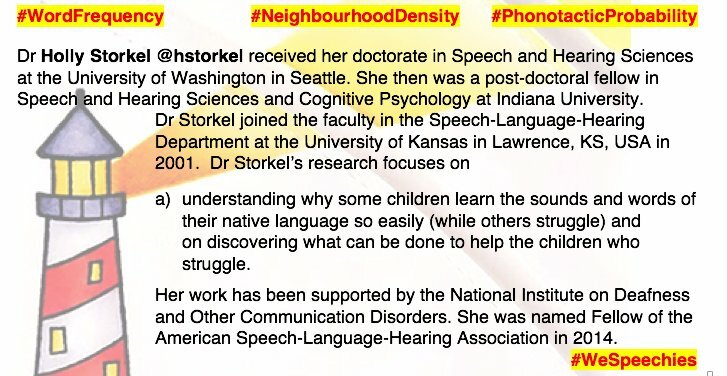 Topic: How can we raise the profile of developmental language disorders? 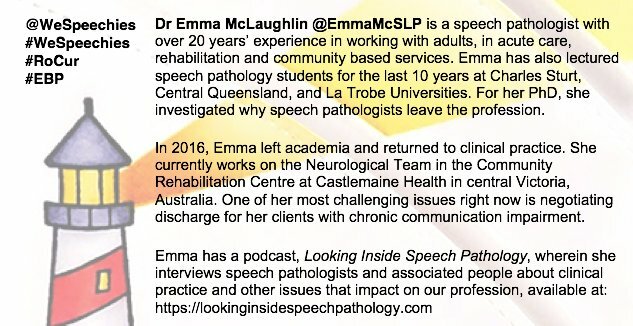 @WeSpeechies Curator: Emma McLaughlin @EmmaMcSLP | Bio | Emma talks about "discharge"
Topic: Crowdsourcing for knowledge translation and citizen science in SLP/SLT: Where do we start? Topic: Theories of ‘language learning impairment and therapy’: How are they reflected in SLP/SLT interventions? Topic: "Peer Review” vs. "Reader Review"? How do you make informed decisions about healthcare and educational literature? 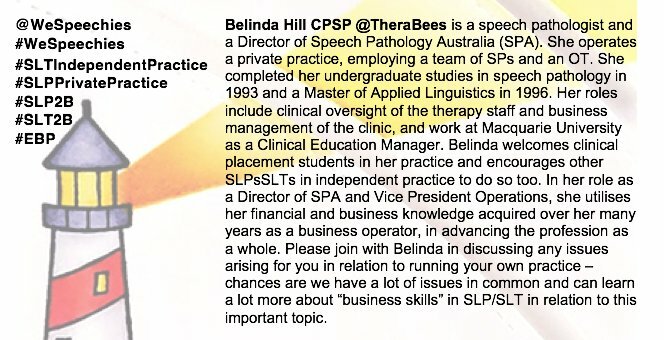 Topic: SLPs/SLTs in private/independent practice: Challenges, opportunities and aspirations. Is the journey taking us where we want to go? 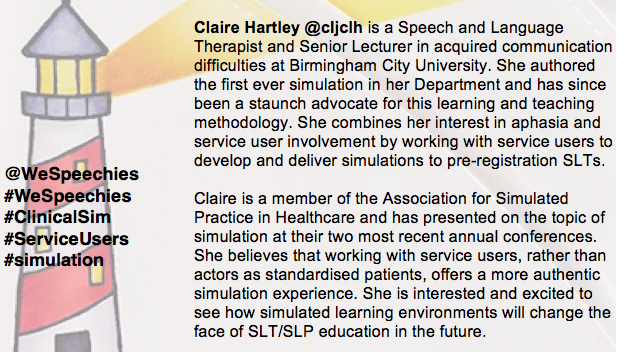 Topic: The SLP/SLT roadmap: Past, present and future! Your voice; your story, @WeSpeechies? Implications of the 10 year Twitter anniversary for clinical, research, and policy impact. Topic: What do we mean by “higher order language skills”, and is this term useful? 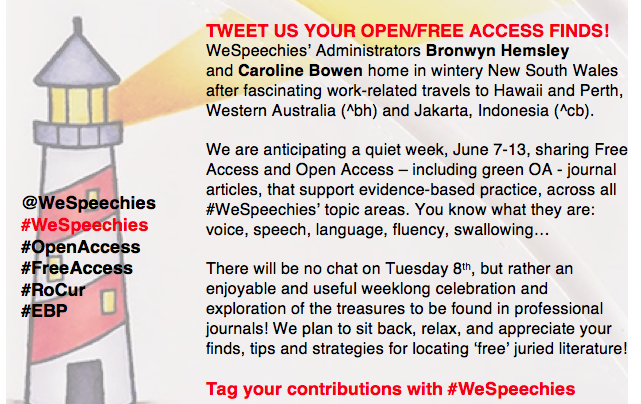 The @WeSpeechies Admins, Bronwyn Hemsley and Caroline Bowen will have their minds and energies on other things until December 8. Bronwyn is taking a short, well-earned holiday and is participating in the RACV Great Victorian Bike Ride from Ballarat to Bendigo. 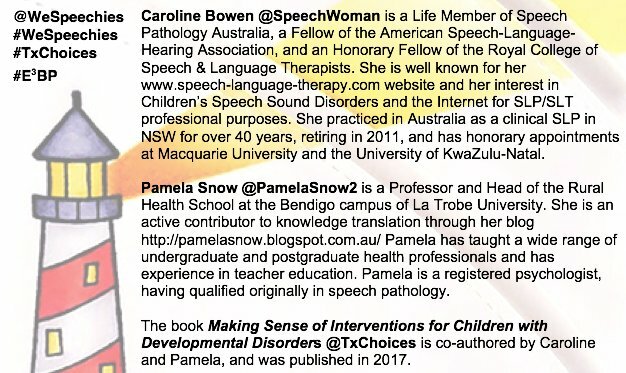 Meanwhile, one-time @WeSpeechies RoCur, Pam Snow (from Bendigo) is getting together with Caroline in the Blue Mountains to work on their forthcoming book, Making Sense of Interventions for Children's Developmental Difficulties. Expect random Tweets throughout the week on goldfields, camping, bike riding, wineries and beautiful Australian scenery (tagged #GreatVic); and collaboration, research, writing, writer's block, pseudoscientific interventions, and as Pam would say, scientific flapdoodle (tagged #WritingOurBook). 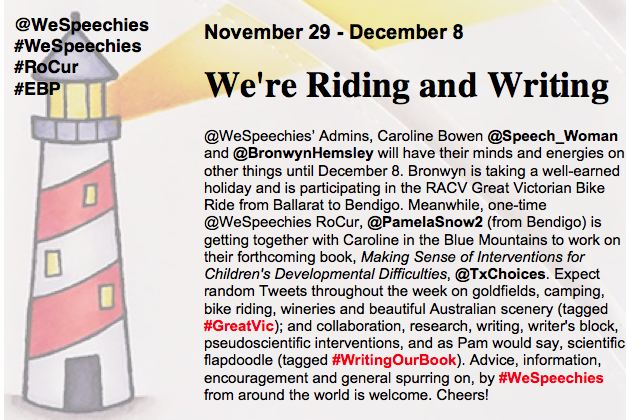 #WeSpeechies' advice, information, encouragement and general spurring on, from around the world, is welcome, Cheers! Topic: Consumer protections and speech pathology services: Are we doing the right things at the right times? Topic: Dysphagia intervention for adults with acquired conditions - who, what, when, how and why? 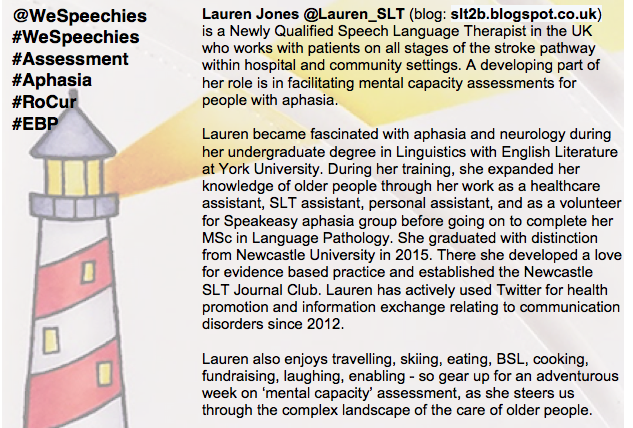 Topic: Online Personal Learning Networks (PLN) in speech language pathology: What's in it for me, and for us as a community? 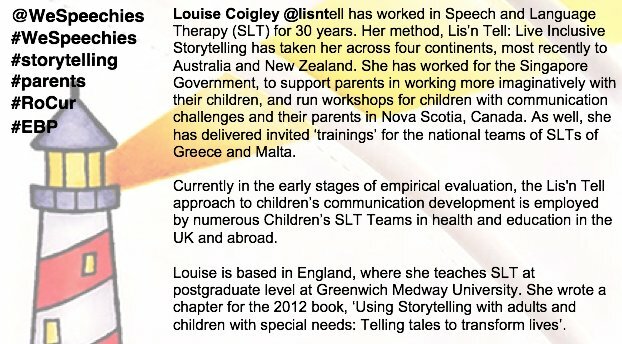 Topic: Speech Therapist? 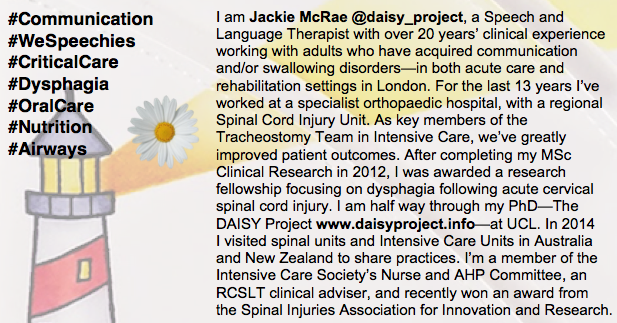 Speech-Language Therapist? 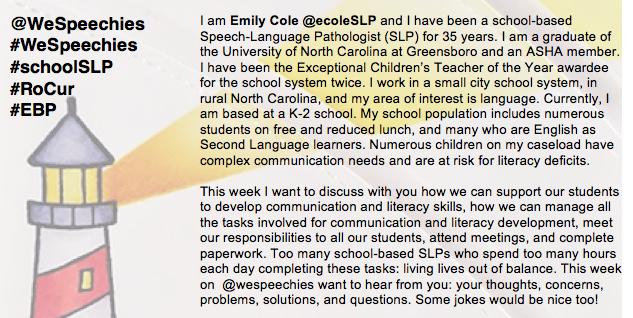 Speech-Language Pathologist? What do we call ourselves and how does that affect what others think we do? 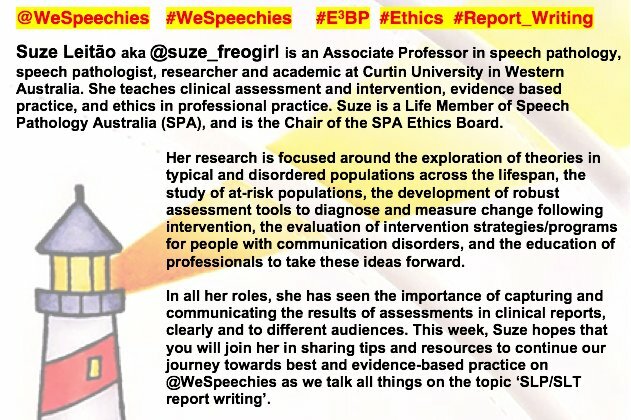 Topic: Treatment intensity and the impact on client outcomes: How do #WeSpeechies manage? There is a selection of the Open Access articles we found, here under June 7-13. Topic: Parents as Very Important Partners (VIPs): How can we work together to optimise outcomes? 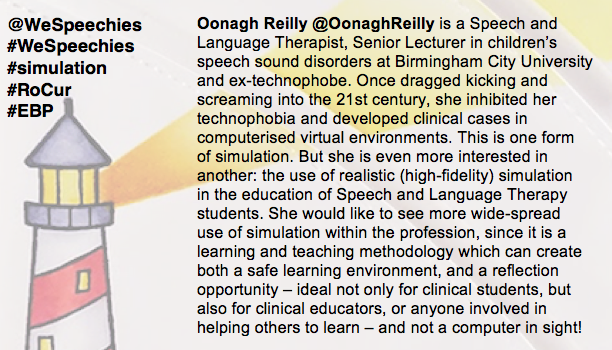 Topic: Innovation and change: How can Continuing Professional Development (CPD) be made more accessible for SLPs/SLTs? 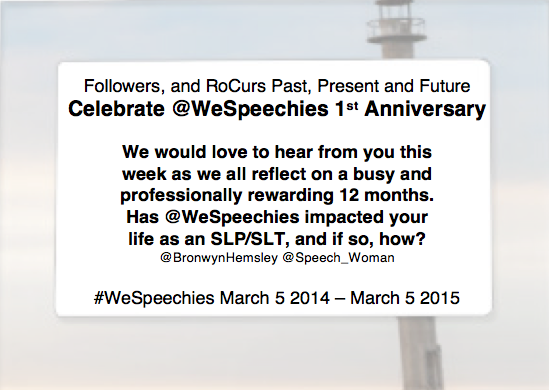 @WeSpeechies 1st Anniversary week March 1-7 2015 - informal 'chat' all week long! Topic: What are you SUPPOSED to be doing? Topic: Is Specific Language Impairment a useful category? 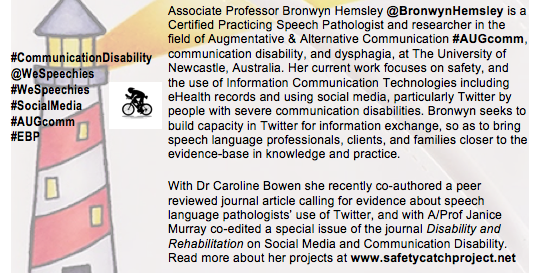 Topic: What is social media's role in supporting countries to establish AAC communities of practice & research? Oral language competence in children and young people: Early beginnings, transition to school, literacy, and the law in the ICP2014 year. Curator: Tricia McCabe: @tricmc curating, with @bronwynhemsley moderating the Tuesday chat. 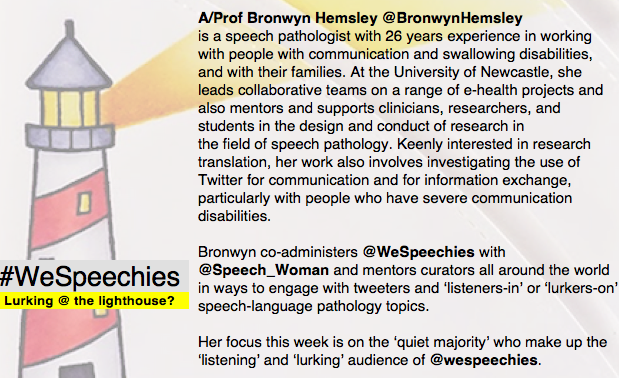 Topic: Conference Tweeting: Why are #WeSpeechies so keen? Topic: Making a change in your practice – what does it take?